Cable modems were developed for residential use in the early 1990s, and common specifications were established through the CableLabs Data over Cable Services Interface Specification (DOCSIS) process in the late 1990s. Early models used a telephone return line; contemporary units use the cable network itself for upstream (from the home) and downstream (to the home) communication. A cable modem connects over the cable plant to equipment in the cable headend known as a cable modem termination system, or CMTS. Since 2000, the mainstay functions of cable modems began to be incorporated on a single microprocessor that could be included in other devices. Examples: The “multimedia terminal adaptors (MTAs) used in voice-over-IP installations, or wireless in-home routers that include a cable modem and a WiFi networking output. A kinder replacement term for the previously known “point of deployment module,” or “POD.” A CableCard (the industry-branded treatment is “CableCARD”,” with the suffix in uppercase) is a removable security card, about the size of two or three credit cards glued together. It fits into “digital cable ready” TV sets and digital set tops, to handle decryption of premium channels. CableCards are for people who walk into a store, walk out with a digital cable-ready device (likely HDTV sets, to start), and decide they want a premium, and thus scrambled, video service from their local cable provider. Shorthand: They want HBO or Showtime. The CableCard’s assignment is to hold the secrets that protect premium services. The CableCard slot, inside the TV or set-top, assures that the device it;s built into (known as the “host”), is a familiar and trusted entity. Together, the card and the slot engage in secret handshakes, to assure that both are on the up-and-up: That neither the card, nor the host, is an imposter. Usage: In early 2004, the beginning of “digital cable ready TV” deployments, it was difficult for cable providers to estimate how many CableCards they needed in stock. CableLabs® - Cable Television Laboratories Inc.
A non-profit consortium largely composed of North American and international cable companies, CableLabs is based in Colorado (off the Boulder Turnpike, between Denver and Boulder) and focused on technology specifications, research and development. In the scheme of things, CableLabs writes the specifications. The Society of Cable Telecommunications Engineers works to turn them into accredited standards. A server, chip, or other storage mechanism that holds frequently requested or frequently accessed data. For example, Internet service providers commonly store data associated with some of the most popular Web sites in “caching servers,” so that customers using broadband collect the information quickly. Usage: Without caching servers, cable modem or DSL users might get a zippy link to the Internet, but then encounter a site that wasn’t set up for speed or heavy traffic. CALEA came into existence because it is no longer enough to gaff a telephone pole a few blocks from a suspect’s location, clamp onto a pair of phone wires, and listen in. If anything has flourished in the history of communications, it is our collective appetite to talk to each other. The electronics marketplace responded. The result is an increasingly complex environment for the good guys to catch the bad guys. At the head-scratching outer boundaries of electronic surveillance is the disposable cell phone, bought with cash. In between are alternative phone forms, like PC-based IP phone, cable’s voice over IP and anything else that allows people to talk over traditionally unmonitored lines of communication. Law enforcement officials require two things from telephone service providers: Call data, and call content. Call data is everything that can happen with a phone: What numbers it dials, what numbers it receives, details of 3-way calls, or call-forwarding activities. Call content is call tapping. This can be tricky in a packet-based, IP environment. A voice call made over the public Internet, for instance, uses the methods of the Internet — which break a bunch of packets into clumps, and send them over varying routes to their destination. The route itself can vary from one call to the next. Usage: PacketCable, the cable industry’s technical specification for voice-over-IP, includes methods for assuring CALEA compliance. A measure of how much traffic a telecommunications network can accommodate. Usually measured in a spectral range, such as MHz or GHz, or in bits-per-second. Usage: Cable network capacity is not only substantial — operating at 6 Gbps plus downstream, if all channels were used — it’s also architecturally re-useable. Definition 1: In a telecommunications context, a telecommunications company that holds itself out to the public for hire to provide communication transmission services. Note: In the U.S., such companies are usually subject to regulation by Federal and state regulatory commissions. Private carriers are not. Definition 2: The unique frequency that comprises a channel capable of carrying video, audio or data. On a radio, for instance, if you’re tuned to 89.3 FM, the identifying carrier is 89.3 MHz. On a television set, channel numbers are used to identify the individual carriers. For example, the carrier frequency for channel 2 is 55.25 MHz. Analog or digital information is encoded into a 6 MHz channel using modulation. In analog, each 6 MHz channel carries one program. In digital, each 6 MHz channel can carry around 10 standard definition (regular TV) programs or two to three High-Definition (HDTV) programs. Usage: Prior to the adoption of fiber optics, cable engineering discussions almost always dipped into horror stories about long strings of cascaded amplifiers. A dated and fading description for what’s now popularly called “cable television.” The term reflects cable’s early gestation in the 1950s and 1960s as a network devoted mainly to fetching over-the-air TV signals using an antenna, and distributing the signals to subscribers over amplified strings of coaxial cable. Usage: People who still use the term “CATV” to describe the cable industry should be handled with respect. They’ve been around a very long while. Usage: DSL technology developers are devising ways to extend the reach of high-speed IP signals even over long distances between customer homes and central offices. An early copy protection system for use on analog connectors (see Analog Hole). CGMSA uses a few bits of a field of a few lines of television (field 2 of line 21, for the intrepid, and yes, that’s the vertical blanking interval) to convey copy rules. Rules include “copy freely,” “copy never, and “copy once.” Included in Microsoft’s Media Center PC. A sort of virtual pasting together of 6 MHz channels, so that the individual throughput of each channel can be aggregated into a larger delivery vessel, inside the big pipe that is a digital cable system. Example: If four 6 MHz channels were bonded, and those four channels used 256-QAM modulation, the resultant “mini-pipe” would be capable of jamming 155 Mbps down to a single cable modem. (The math goes like this: 4×38.8 Mbps = 155 Mbps.) If 10 channels were bonded, the mini-pipe would offer 388 Mbps — again, to a single receiving modem. Figuring out what one might do with 155 Mbps to a single device is sort of like figuring out how you’d spend the $365 million Powerball. But, saying “we’ll never need it” is forever an invitation to be proven wrong. People used to say they’d never need more than 330 MHz. Today’s carrying capacity for a cable system is 750 MHz, sometimes 860 MHz. Name one cable operator complaining of excess capacity. Competitively, channel bonding is a way for cable providers to match or surpass telco-promised networks, capable of rendering 100+ Mbps to homes. It also provides a capacity plan for the delivery of multichannel video, both standard and high definition, over the IP side of the plant — again, to a single receiving device in the home. When it’s time to start planning the actual implementation of channel bonding, as a means to wideband, it’s important to know this: It isn’t “found bandwidth.” Those standard 6 MHz cable channels earmarked for bonding still need to be located and cleared off. A measure of how many television channels or services can be delivered, as a function of available bandwidth. In contemporary cable systems, the math of channel capacity happens in three steps. First, subtract upstream spectrum and guard band from the total bandwidth. 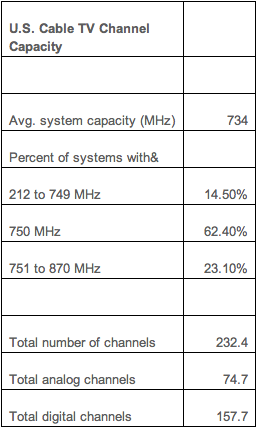 That’s 750 MHz total available upstream and downstream bandwidth, less 45 MHz for upstream traffic, equals 705 MHz. Then subtract 30 MHz for unusable and guard bandwidth. Divide the remaining 675 MHz by six, because each cable channel occupies a 6 MHz chunk. You’re left with just over 112 channels, useable for voice, analog and digitally compressed video, and data services. Usage: In the mid-1980s, programming networks cheered when cable operators elevated channel capacity to a baseline of 35 channels. A legal authorization to make electronics devices that comply with cable industry requirements, mostly about removable security. The easiest way to fathom CHILA is to pretend you;re a consumer electronics manufacturer who wants, in the fastest way, to develop two-way products that work, on a national scale, with the cable industry. One option is to participate in (wait) the larger, cross-industry, two-way talks, known also as “the two-way plug and play” negotiations. Cost: Time. Another option is to sign what’s known as a “DFAST” license, which is, in essence, a trimmed down version of CHILA that doesn’t provide any specific compliance assurances. Very specifically, it doesn’t include OCAP, or the OpenCable Applications Platform. (Short version is, it’s cable’s middleware. See OCAP.) Cost: Potential to make products that don’t work. The third option is CHILA. As of early 2006, five CE manufacturers were CHILA signatories: LG Electronics (the former Zenith Corp.), Samsung Electronics America, Panasonic Consumer Electronics, Digeo, and Thomson Consumer Electronics. All said they did it to get two-way products into the cable market more quickly. Usage: Devices born out of CHILA could begin to enter the retail marketplace in 2006. A miniaturized collection of electronic circuits (or “gates”) often numbering in the millions. The word “chip” is synonymous with “silicon” and “integrated circuit.” Chips vary in size, denoted in microns. They also vary in the number of pins that stick out like tiny metal legs, to be inserted into a printed circuit board. Usage: One has to wonder when the silicon gurus will come up with a billion-gate chip. Get it? Billion Gates? When the current moving through a laser changes, it causes a blip in the wavelength that’s carrying a particular signal. Chirp is more troublesome in some lasers than others. Usage: Directly modulated, 1550 nm DFB (distributed feedback) lasers tend to have the highest chirp sensitivity. The color part of a video signal, including hue and saturation, but not brightness. The brightness of a picture is measured by its luminance. Usage: A washed out picture usually indicates low chrominance; a picture where colors bleed into each other shows high chrominance. Activity associated with customer disconnection of telecommunications services. For cable and satellite providers, it’s typically expressed as a percentage. The churn percentage indicates the number of customers who discontinued service over a particular length of time, divided by the total number of customers during the same time period. An example: If there were 25,000 customers to a “Digital Gold” video package during August, and 250 of them called in to discontinue their subscriptions, the monthly churn level was 1 percent. Churn haunts providers because it creates an ever-present need to attract more customers to make up for the falloff. One of the most dramatic recent examples comes from the satellite TV sector. In 2004, the annualized churn level for DirecTV was roughly 19 percent. Although DirecTV succeeded in adding close to 1.73 million new subscribers during the year, it actually lost close to 2.5 million customers in the same 12-month period. The net increase came about because DirecTV signed up slightly more than 4.2 million “gross additions.” The net subscriber increases were what was left over, after subtracting disconnected households from gross additions. Usage: Churn often is described colloquially with a “leaking bucket” analogy. To combat the effect of churn, telecommunications providers must pour more new customers into the top of the bucket each month than they lose from leakage. The electronic equivalent of the female voice, in days of yore that politely asked: “What number, please?” then connected your phone line (or, more likely, your grandparents’ phone line) to the person being called. A circuit, in this instance, is a line, and a switch is the device that connects you when you make a call. It works like this: You pick up the phone. In telco parlance, you’ve gone “off hook.” The switch at the central office acknowledges this by supplying you a dial tone. You dial the destination number; the switch interprets that information, and passes you to a switch at the destination end. There, a switch notifies the destination phone line by inducing a ring tone. When the called party answers, their phone puts a short on the line, to notify the switch that they’ve answered, and the call can come through. The majority of existing telephone and dial-up modem calls is circuit-switched now, although that’s shifting with the development of IP telephony. Usage: An early question to cable providers shifting to VoIP from circuit switching was how they would avoid stranded capital, particularly in those “big iron” circuit switches. A term that entered the telecom lingo as a result of the Telecommunications Act of 1996, to describe companies that target select geographic regions to provide competitive alternatives to local phone, long distance, data communications, and (sometimes) video servers. CLECs either lease or build their own telecommunications lines, both wired and wireless. They vie against incumbent local exchange carriers (ILECs), once known as “the Baby Bells,” as well as interexchange carriers (IXCs). Since the first edition of this dictionary, CLECs went from boom-grade darling to Burnoutville. A software and network architecture term for anything that resides, electronically, at the user end of a particular configuration. A client-server configuration, for example, refers to a co-dependent linking of a main information repository (the server) connected to any devices that rely on the server for instructions and information. That could be a set-top box, or a computer. In a local area network, the PCs linked together are the clients. device by shifting them to the remote server. In the case of program guides and video-on-demand, a small software kernel is loaded into a set-top box. The EPG client pops out to a remote server to fill up on daily program listings. The VOD client zips out to the remote server anytime someone orders, plays, pauses, rewinds, or fast-forwards a show. Usage: Two client-server classics exist in multichannel video networks today: The electronic program guide (EPG), and all flavors of video-on-demand. Distortion that occurs in cable systems when signals get too out of whack (usually too loud) for the “ears” of an optical receiver/transmitter, whose job it is to send those signals along without disturbing them. Clipping shows up in an analog TV as dashes in the picture, resembling electrical interference. In tech-speak, the effect is inter-modulation. A group. In cable, a collection of contiguous or nearby systems owned and operated by a single company. The period between 1997 and1999 pushed the “cluster” word into the industry lexicon on a regular basis, as cable providers bought and sold systems, consolidating themselves into geographically significant groups of systems. Equipment located at cable signal collection centers — sometimes in the headend, sometimes in distribution hubs — that talks to the cable modems installed in homes and businesses. The term itself is spoken as its constituent letters. Usage: The CMTS is the modern-day steward of data packets that traverse the high-speed cable IP network. The wire that gave a name to a $60 billion U.S. industry. The wire itself is constructed with a copper-clad center conductor, surrounded by a foamed dielectric, surrounded by layers of aluminum for protection against leakage (in or out). The center conductor and the aluminum share the same axis — hence the coaxial. Around all of that is a jacket, usually made of PVC or polyethylene. Center conductors can be made of aluminum (in the case of trunk, or “hard line” cable) or of steel (in the case of drop cable.) The dielectric is an insulator; dielectric materials, in general, consist of glass, ceramic, rubber, or plastic. Coaxial cable dielectric is usually foamed polyethylene. Some coaxial cable, such as those designed for installation in overhead/aerial drops, also include a steel messenger line for strength. Drop cables generally contain several layers of aluminum protection, both foil and braided, to protect unwanted signals from leaking in (ingress) and to keep desired signals from leaking out (egress). A portable telephone that works both in “cellular” mode and in wireless Internet protocol (IP) mode. Reason: Ever notice how cellular service doesn’t always work so well in your house? Maybe you live in a neighborhood that has covenant problems with big cellular antennas. The combo, or “dual mode” phone, introduced in 2004 by several major cell phone makers, enables the phone handset to operate over WiFi. There are two advantages, over and above the fact that your phone works better in your house (assuming you have WiFi in your house). One involves cell phones that come with built-in cameras. If ever you’ve tried to transmit a still image (let alone a video) over the cellular network, you were probably reminded of what dial-up felt like, before broadband. We’re talkin’ slow. WiFi is a broadband variant; pictures fly. Advantage number two is voice quality, which gets toward high-fidelity. The next big steps are the business deals — like the one etched between Sprint/Nextel and four big cable providers (Comcast, Time Warner, Cox, and Advance-Newhouse) in 2005. On the business end, combo phones open doors for those kinds of partnerships, in a “here, let me carry that for you” sense: Whoever operates the network behind the WiFi spigot can help to offload traffic from the cellular network. And vice versa. Usage: New generations of mobile phones are ambidextrous, capable of latching on to traditional cellular networks or in-home wireless frequencies. Squeezing something down, usually so that more can fit. In broadband, compression happens after video or audio material has first been encoded (digitized), or transformed into a series of digital bits. Any video, voice or data signal can be compressed. In fact, just about anything that can be digitized can be compressed. In digital video, the prevalent compression method is MPEG-2, where the “MPEG” stands for Moving Picture Experts Group. With MPEG-2, video can be compressed in such a manner that digitized material that would otherwise occupy 10 or more traditional television channels can comfortably be delivered in a single channel. The MPEG-2 specification works by looking at each frame of video (there are 30 frames each second in a television signal), one at a time, and comparing it to both the preceding and following frames. Any bits that represent sameness from one picture to the next — the background behind the talking head, for instance — are removed. The wrinkle in excising duplicative information from one frame to the next is the high-motion show. Hockey games, for example, are particularly challenging to compress, because of the swiftness of the game — and especially the puck. Because of that, high-motion shows demand more bits per second, and, consequently, a lower compression ratio, so as to do justice to the action. More recently, digital video providers began examining the use of advanced video compression (see “advanced codec”) as a way to further squeeze digitized material. At this writing, advanced codecs include the acronym soup that is MPEG-4, H.264, MPEG-4 part 10; plus VC-1, Windows Media 9, and Real 10. The logic in advanced compression goes like this: A piece of video encoded with the new stuff, at a rate of 1 Mbps and dropping, looks essentially the same as a piece of video encoded with the existing MPEG-2 stuff, at 3.5 Mbps. Translation: A thinner stream works just as well as a thicker stream, to do the same thing. The rub with advanced compression is that the fielded base of devices using MPEG-2 can’t do it without a box swap out. (A truth for cable and satellite boxes.) That makes it great for “green field” providers (think telco video here), but not so great for companies (cable and satellite) with vast and growing numbers of planted boxes. Still, though, if advanced compression means an operator can cram, say, three HDTV channels into one digital channel, instead of two, swap outs may still make sense. The existing HD boxes could be reapplied as “standard definition” boxes, avoiding stranded capital. At this writing (autumn 2005), HDTV subscriber numbers are still low enough for an advanced compression swap-out to be an option. Usage: Using advanced compression and 1024 quadrature amplitude modulation, technologists estimate six to nine HDTV channels could fit into a standard 6 MHz width. The technologies that allow a video customer access to a particular service, on the condition that they’ve agreed to its terms and conditions (and, usually, fee structure). Generally, conditional access is a set-top security thing. It’s the enforcer: Only people who order and pay for premium services (HBO, Showtime, Starz!, etc. ), receive them. The other part of set-top security is the actual encryption, which scrambles/unscrambles digital content. In the OpenCable specification for digital video, conditional access occurs in a removable CableCard (see CableCard). When a consumer buys a digital cable ready TV or HDTV at a retail store, and decides to spring the extra amount for a premium channel, the cable provider issues the CableCard. Usage: Satellite TV companies were the first multichannel TV providers to embed conditional access security into slip-in cards on a massive scale. A digital method for transmitting data, such that a fixed percentage of the total available data rate is prescribed to a device. Uncompressed telephone signals and digitized, compressed video are two services that fare better when transmitted at a constant bit rate, because both are sensitive to delays. In digital telephony, for example, a T-1 line equates to about 1.54 Mbps, which is the equivalent of 24 digital voice streams (each is 64 kbps, plus 8 kbps of overhead). Slotting each call within that one 1.5 Mbps stream such that each call is allocated a rotating time slot is known as time division multiplexing, or TDM. Constant bit rate is one method used within TDM; the other is variable bit rate, where data channels vary in response to user requirements. Words, images, sounds. (Still) the prevailing digital-era description for any sort of entertainment, information or service delivered to homes. Since the last edition of this dictionary, one noticeable trend happened to the word “content.” It’s now often trailed by the word “protection” (see Copy Protection). Blame Napster, pre-content protection. The long-awaited commingling of technologies and applications associated with heretofore disparate content and communications services. When you watch the live video telecast of the Atlanta Braves/Washington Nationals baseball game from a PC screen, courtesy of MLB.com, you’re steeped in convergence. Why? Because a personal computer once reserved purely for managing digital documents in the study is married up with a television broadcast once available only on the living room TV set. The convergence angle works in lots of other ways, too. When a grandfather in Duluth receives an alert from his mobile telephone signaling the arrival of a photograph of his new grandchild in Boise, that’s a convergence of two platforms — the telephone and the digital camera — that used to live in general ignorance of each other. On the cable side (Internet readers, this dictionary was originally written for people in the cable industry), convergence is everywhere: Delivering telephone conversations over cable networks represents convergence on a grand scale. So does the presentation of Web content on the TV set. Convergence, though, isn’t reserved purely for technology descriptions. It’s also used to address structural changes in the telecommunications industry that have led telephone companies to begin offering cable TV-like video services; and cable TV companies to offer telephone service. Usage: “It has been a long time coming. But now, there’s no doubt that the capabilities of the TV and the PC are becoming fully integrated. And that has profound implications for all of our business.” – Comcast Corp. CEO Brian Roberts, speaking about “convergence” to The American Association of Advertising Agencies’ annual convention in March 2005. The cryptographic processes for securing an audio or video program from unauthorized duplication. Copy protection is a word that revolves around the new world of digital media, because digitized video and audio is pristine, and easily duplicated if not protected. Copy protection is a very big deal to the future of distributed entertainment. It’s also a very big deal to consumer electronics devices, because copy protection and “plugs” tend to go together. For example, people talk about “IEEE 1394/Firewire” (a plug) in the same breath as “five C” ( a copy protection method.) Or, they’ll mention “DVI” (plug) with “HDCP” (copy protection). Five C, or “5 Cs,” refers to the five companies (Hitachi, Intel, Matsushita, Sony and Toshiba) that wrote the copy protection scheme and encoding rules that go with the Firewire connector. The 5C copy protection mechanism works by applying encoding rules that dictate whether a show can be copied, and if so, how many times. For consumers who (eventually) own recordable DVD players, and want to build up their DVD library, there’s a provision for “copy once.” And, there’s a setting for “encrypt but don’t copy protect,” and one for “copy freely.” Because the output of the Firewire/1394 connector is a compressed digital signal, it’s great for transmission and copying but not so great for high definition graphics — which affects things like the electronic program. HDCP stands for “high bandwidth digital copy protection.” It works with DVI connectors, which are actually fierier than Firewire, moving data at 5 Gbps. In-home devices that work in conjunction with a service provider network. Examples include telephones, televisions, set-top boxes, phone adapters, or little handheld gizmos that accept big downloads over broadband. CPE started out as one of those terms that tagged a person as having telco roots when they said it. Nowadays, it’s more prevalent in other service provider sectors. To securely affix, as in a connector onto a wire. Usually completed using a specific tool. Usage: Craftsmanship and the proper crimp of an F-connector onto a coaxial cable are keys to good signal quality in the home. An undesirable phenomenon specific to twisted-pair wires, such as those used by telephone companies to provide voice and data service. Cross talk happens when energy from one line bleeds into another, because phone wires are bundled into one sheath to the central office. That means they’re close enough to one another that the DSL traffic, because of where it’s housed in the radio frequency (RF) spectrum, could radiate from one pair of wires to the next. To the DSL equipment, it looks like noise. As DSL traffic increases, the noise floor rises. As the noise floor rises, data rates decrease. With voice, the effect of cross talk is hearing a telephone conversation on your line — that isn’t yours. Usage: Cross talk shows up in the form of sluggishness, on DSL wires, and signal problems with phone conversations. A Virginia-based trade association that supports and promotes marketing professionals in the cable and broadband sectors. Its role has shifted over the last several years to encompass technologies and the manner in which they’re presented to consumers. Usage: Once devoted almost purely to marketing disciplines, CTAM now aspires to bridge the worlds of technology and marketing.